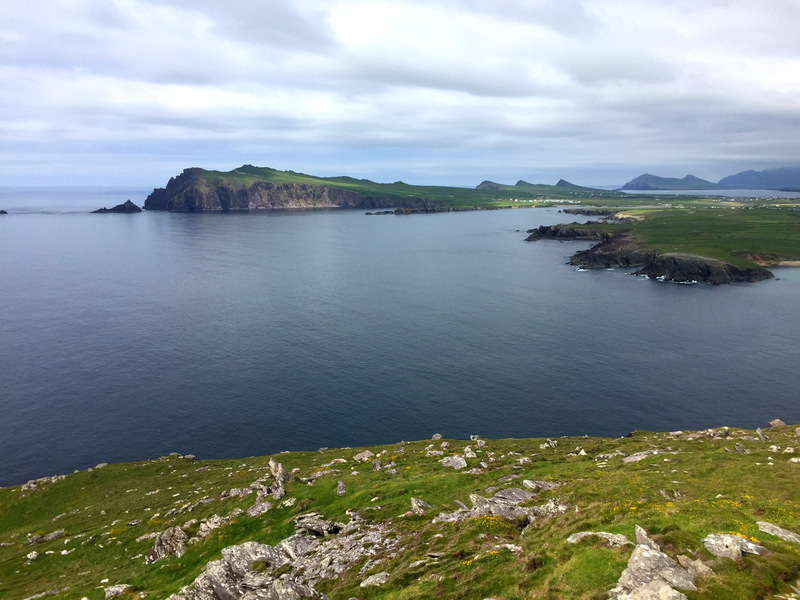 Visiting the Dingle peninsula in County Kerry was one of the highlights of our trip to Ireland. The scenery is spectacular – towering green hills falling into the deep blue ocean, with five times as many sheep as people in the towns along the way. It was an easy 40 minute drive from our rental home in Killarney, so we packed in a full day. Slea Head Drive takes you all around the peninsula (clockwise only!) and is only around 30 miles, but if you’re anything like us you’ll be stopping every few minutes to take a stroll, learn some history or even just enjoy the views. 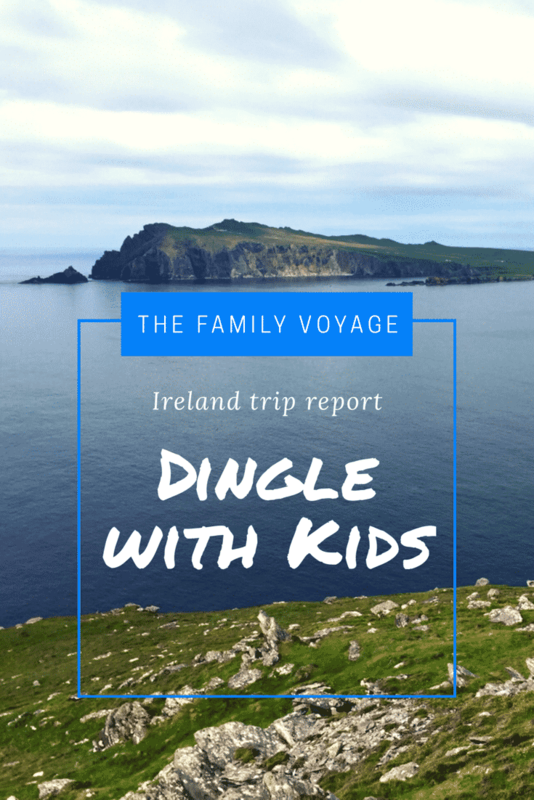 Read on to check out some of our family’s favorite things to do in Dingle, Ireland – we think your family will love them too! 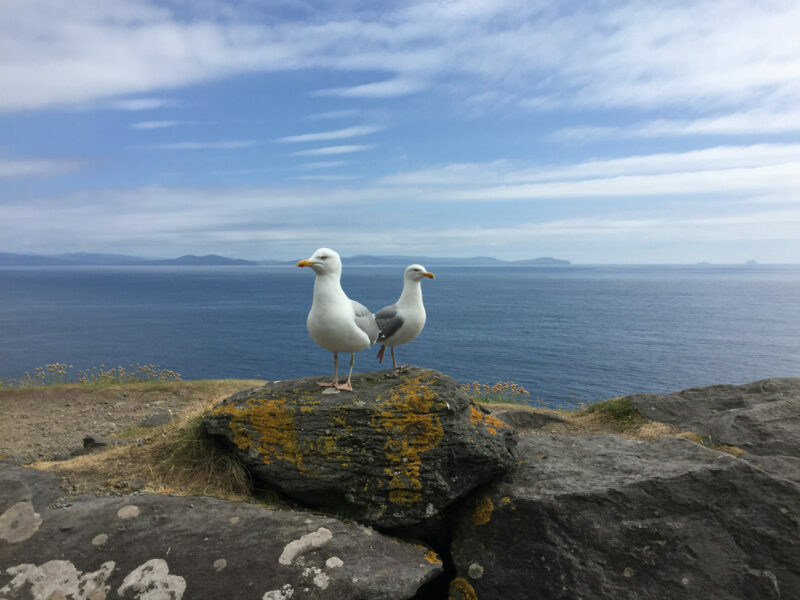 Want to see the rest of our Ireland with Kids trip report? Inch Beach is wide and flat, so the sand is damp even if you’re pretty far from the water. We didn’t realize that, so we had to buy a towel from the shop. Whoops! If you have travel towels with you, this is a great time to use them. You may also want to bring a change of clothes. We didn’t mind getting a little wet – we love picnicking and playing in the sand. It’s also a great beach for strolling and collecting seashells so bring a little bag (we use a small wetbag) for your kids’ latest treasures! 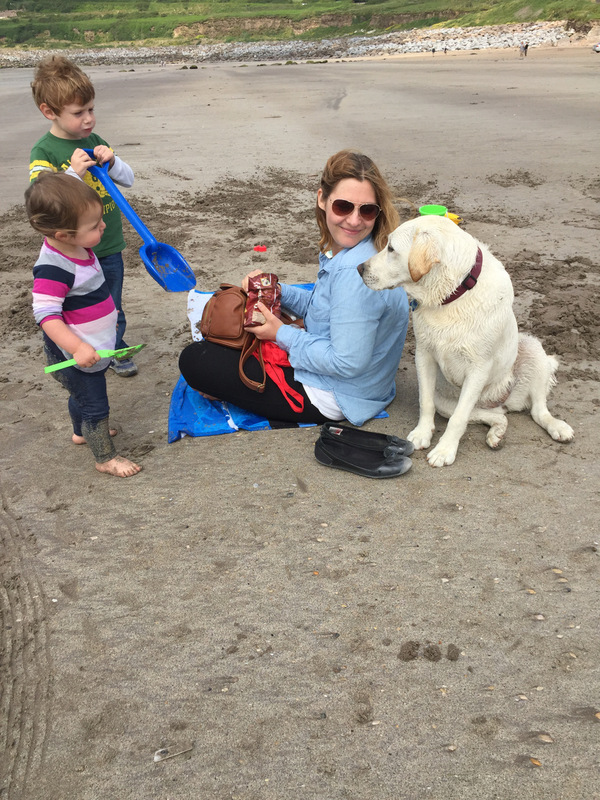 We even made a new friend while we played in the sand! Soon we were on our way to Slea Head Drive! 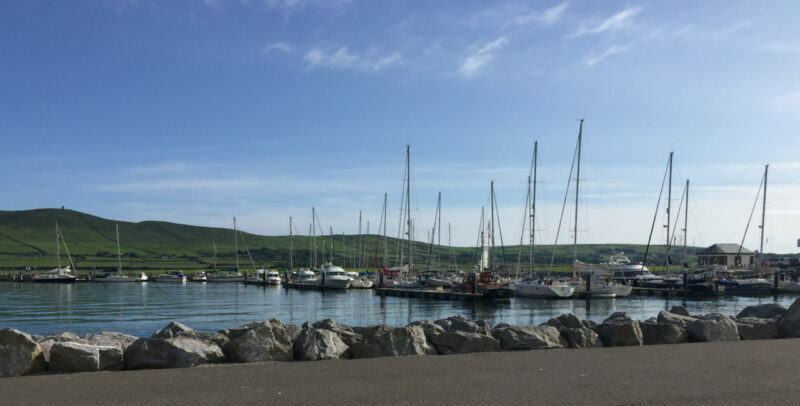 If you’re wondering what to do in Dingle, this drive would be my top pick! 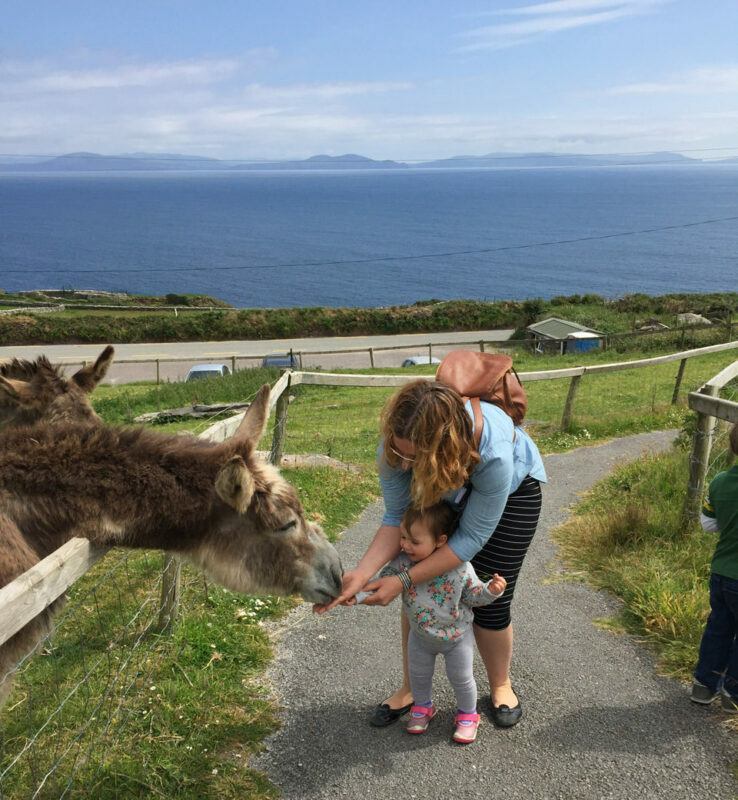 This stop is a must if you’re visiting Dingle with kids! 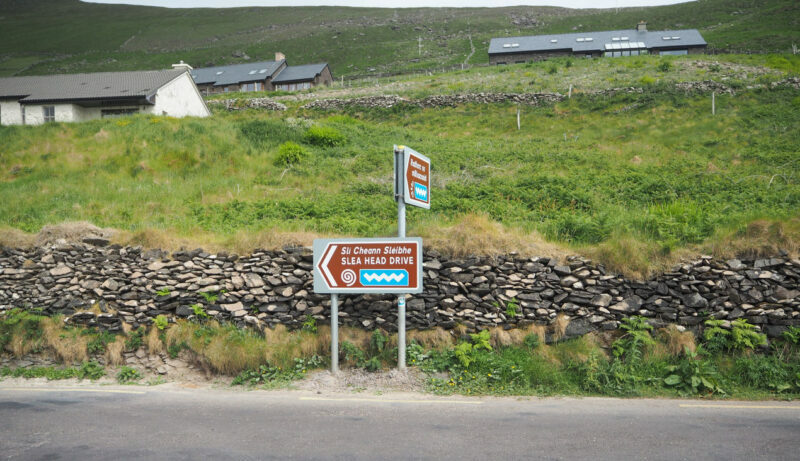 It’s located on the right side of Slea Head, about 8km past the town of Ventry. This stop is a two-in-one, which we loved since we it’s sometimes like wrestling wild animals to get Jacob and Shoshana back into their car seats. Speaking of animals, the first part of this stop (and the most important, if you ask our kids) is playing with farm animals! The kiosk the parking lot sells admission tickets to the cottage up the hill, but also provides bowls of animal feed. It’s a steep walk up the hill for tiny legs, but our kids were happy to do it. They spent almost half an hour feeding and petting goats, sheep and donkeys – with no other people around. We were having so much fun that we may have sent Ronnie back down the hill a few times for more feed. The world seemed silent, with just our voices and a few animal noises to be heard. As you can see, the view’s not bad either. If you’re doing Slea Head Drive with kids, make sure this is on your list. Shoshana loved feeding the animals and the donkey sure loved being fed! When we eventually got the kids away from the animals, we proceeded up the hill to the Famine Cottage. The main cottage dates from the early 19th century and there is also an 800 year old “beehive hut”. The buildings on the property are all furnished as they would have been over a century ago and panels on the walls tell the story of the family who lived there as well as the struggles of the Irish during the Great Famine. I’ll admit that I’m often the person at the museum who reads every sign on the wall and irritates her companions, and this stop was no exception. This would be a great stop with school-aged kids to help them better understand the history of that era; teaching history beyond the textbook is a huge part of travel with kids. Even with little kids, we were able to explain to them that a whole family used to live in that house and struggle for food. Just ignore the creepy life-size figurines staring at you from the corner. Back outside in the brilliant sun, the view down the hill is glorious. Needless to say, Jacob and Shoshana didn’t wait for us before running back down the hill to feed the animals again. We even got a rare picture of our whole crew thanks to another visitor (nice thumb!). We continued driving along, stopping periodically to take pictures of the scenery. Just past Dunquin and Ferritersquarter we pulled off to the side along with a few other cars. There’s a sweet little nature walk along a dirt trail that’s perfect for families and offers beautiful views. We were rewarded with a postcard view of “The Three Sisters”, a series of peaks at the far west end of the peninsula. Shoshana did her first independent hike and we were so proud of her! Jacob loved scrambling over the rocks and letting his adventurous streak come out, and giving me a few heart attacks was a nice bonus. This is a wonderful Ireland hike for kids. At last, we arrived in Dingle town after a long day in the car. Dingle has a reputation as a foodie town, so Ronnie was excited to enjoy some fine dining. 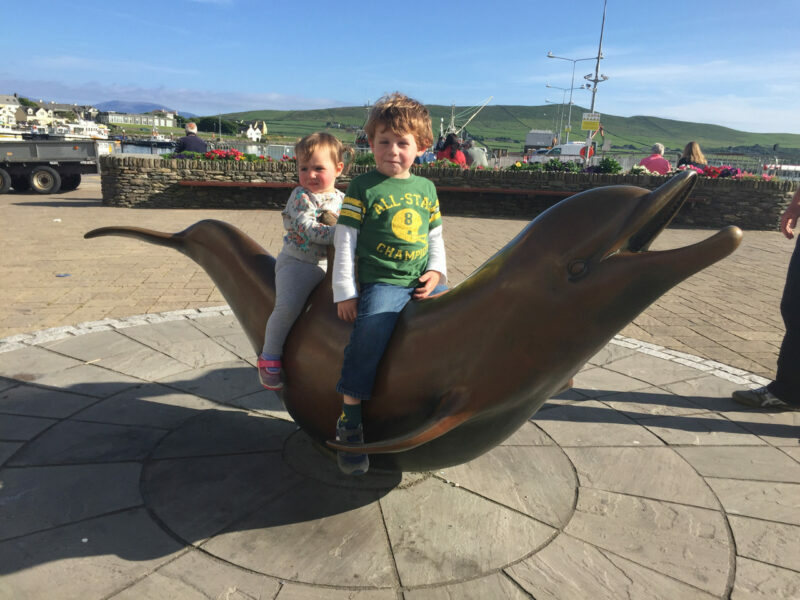 We found easy parking right near the harbor and enjoyed a slow stroll next to the boats and hung out with the statue of Fungi the dolphin – another highlight of the day for the kids. The restaurant is perhaps five minutes’ walk from the harbor. If you have time during your visit to Dingle with kids, take a harbor cruise to spot the real Fungi! As they say: Man plans, children laugh. We had made a res at The Chart House on our drive into town. The reviews looked great, the location right near the water was idyllic and they offered a high chair. It wasn’t the kids’ finest time in a restaurant, though it was the finest dining we did in Ireland. One spilled an entire glass of orange juice and required 15 minutes with the hand dryer in the bathroom before agreeing to get dressed again. The other wasn’t happy sitting and needed to spend most of dinner walking and playing outside. Sometimes that’s just the reality of traveling with kids, but we always try to stay flexible. All that said, the food really was excellent. The fish is the star and it was extremely fresh and delicately prepared. If you go around 6pm, there is a discounted early dinner menu available. There is no kids menu, but the kitchen was happy to prepair plain salmon for the kids. I highly recommend a reservation, as The Chart House is one of the top restaurants in Dingle. No evening in a Kerry town would be complete without a visit to Murphy’s for a scoop of their locally inspired, locally sourced, locally made ice cream (see my previous entry). The location fronting the harbor closed after dinner, but a kind teenager pointed us a few blocks away, where the other Murphy’s location is. And everyone was happy. We ended the evening with a little music and some beverages. Dingle is a small town, so on a weekday there may only be a few places with live music. We were fortunate to wander into The Dingle Pub – a great way to wrap the day. The staff was happy to bring the kids tall glasses of milk as we sat back to enjoy some traditional music! Does your family have any favorite scenic drives? Tell us below and maybe we’ll add them to our travel bucket list! Beautiful beaches hills and cool houses what fun. I would say that you are the cutest family ever and that you are my #familygoals! This looks like a really lovely day trip! I did a trip around Ireland with my family when I was younger, but I would love to set up a Home Exchange to go back and really have time to explore. Playing with the farm animals must have been so fun! 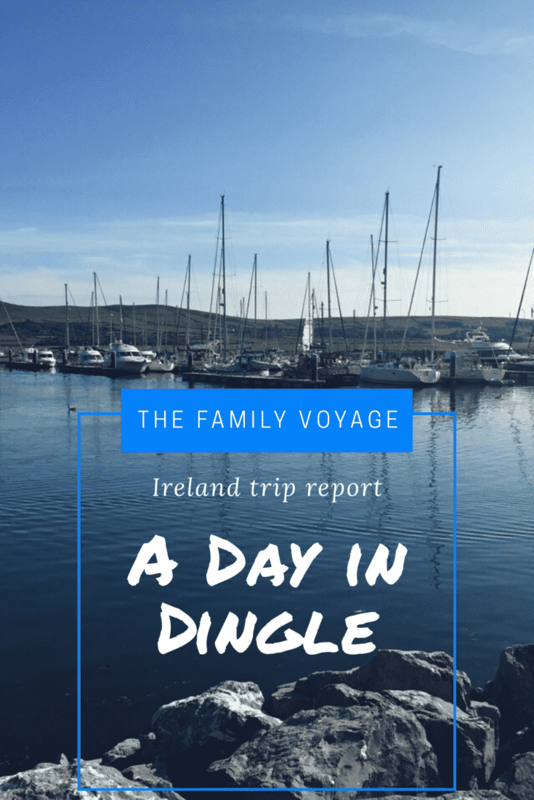 Dingle looks like a great place to visit! I’m heading to Ireland this fall, and after reading your post, I want to add Dingle to my itinerary. The farm animals are so cute. 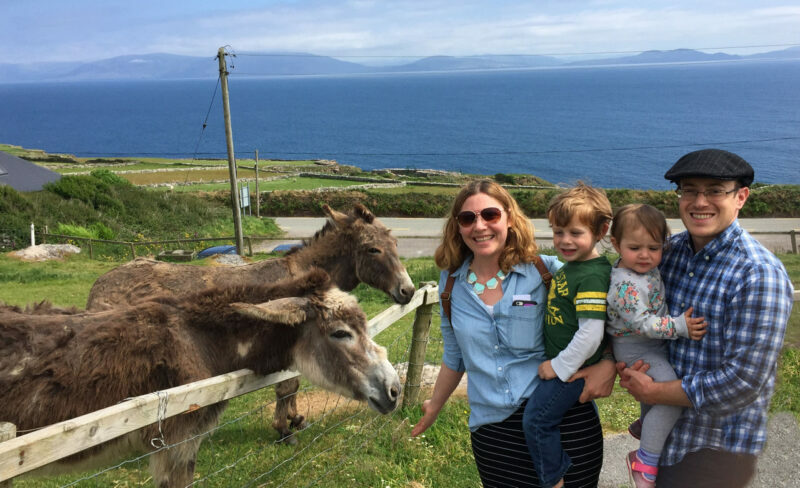 Looks like your family had a lot of fun in Dingle! I missed Dingle the last time I visited Ireland. It seems like a great way to independently explore is to rent a car – I took tour buses. “The Three Sisters” is a viewpoint that I don’t want to miss next time! Well, you can’t go wrong with the coastal highway in southern California! It’s pretty stunning to see the ocean, beaches, beach towns, and more as you drive. And I just have to mention your photo with the seagulls is absolutely stunning! We went to Dingle a several years back and loved it. Great travel tips for kids and adults! I’ll be back that way this fall, we might just have to check it out again. Pinning this to my Family Travel board – wonderful tips! Your photos are spectacular! So many fun things to do with the kids. We did a road trip in Tasmania in January with the kids and it was a great place – so many fun things to see and do. Tasmania looks amazing! I’m thinking about visiting next year, so I’ll be sure to hit you up for advice. What a great experience for your little ones! Beautiful scenery and lots of fun activities! I can’t wait to explore Ireland.